There is more than one way to replace the roof of your home, and our team of highly skilled and experienced roofers in Cleveland will help you to find the roofing method that is right for you. Our roofers in Cleveland can either re-roof over your existing roof or tear off the current roof to replace it with new shingles connected directly to the bare surface of the roof. Our team of roofers in Cleveland are able to re-roof by layering over the current roof with new shingles. 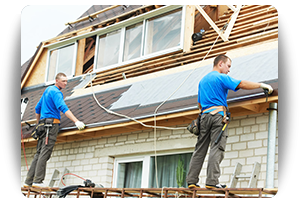 While this is a less expensive and faster route of roof replacement, it requires some knowledge of your current roof. Known leaks must be mentioned and unknown leaks must be discovered if they exist at all. If the roof has not shown signs of being problematic, then a layover roof is an option. Another factor for our roofers in Cleveland and you as a homeowner is how long you need your roof to last. 15 years is considered to be a long life for a layover re-roofing job. If you plan on being in your home for more than 15 years, it may be in your best interests to have our roofers in Cleveland tear off the current shingles and re-roof from the ground up. If you plan on staying in your home for more than 15 years, have substantial leak issues with your current roof, or would like to change the style of your roof, you will need to consult The Siding and Insulation Company’s team of roofers in Cleveland about tearing off your current roof’s shingles to replace them with a new set of shingles or metal sheets (depending upon your needs, tastes, and wants). Tear-off jobs are considerably more expensive than layover re-roofing, but as our team of expert roofers in Cleveland will tell you, the rewards are well worth the investment. The roofs last longer, are more secure, and benefit from the latest in textile and shingle developments that prevent water and ice damage to the roof. If it’s time to consider a new roof for your home, Contact Us to schedule your free estimate on layover re-roofing and tear-off jobs from our roofers in Cleveland: (216) 281-5656.